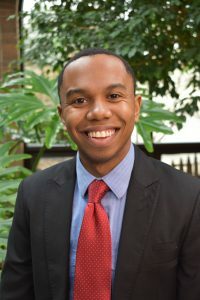 Daniel will be participating in the performance of Misa Criolla by Ariel Ramirez for the Easter vigil concert on Saturday April 20th, 2019, 4:00 pm. Plymouth Congregational Church UCC 501 W. Berry Street, Fort Wayne, Indiana 46802. This is a free event. Daniel and Elaina Robbins will perform for the Fridays in May concert series at Trinity English Lutheran church, 450 W. Washington Blvd. Fort Wayne, IN 46802-2916, Friday, May 10th, 2019, from 12:10-12:40. This is a free event. The program will include songs by Yoshie Okawara and Toru Takemitsu. Daniel will be participating in the Fort Wayne Cherry Blossom Festival with vocalist Elaina Robbins. This festival is Sunday May 19th from 12:00 until 5:00 pm. Performance time will be posted soon. We will be performing works by Yoshie Okawara. This is the first performances of these works outside of Japan, and also the first time they have been performed since the 1930’s. This is a free event and a great festival! Daniel will participate in the Saint Mary’s College Music faculty concert on April 1st at noon in Stapleton lounge. This is a free event. Program will feature the Fantasia for guitar and piano by Mario Castlenuovo-Tedesco. Jikyung Geena Kam will play the piano part. Daniel will be performing Red Forest Suite, by Tim Reed, on a Farrell Vernon’s faculty recital on Sunday, November 4th, 2018, at 7:30 pm in the Rhinehart Recital Hall at Purdue University Fort Wayne. 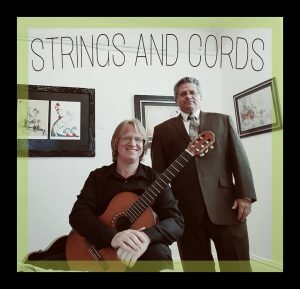 Strings and Cords will perform a short noon time concert for the Wednesday on Wayne street music Series. October 10th, 2018, at the First Wayne Street United Methodist Church, 300 E Wayne St, Fort Wayne, IN 46802. Admission is free, so bring a friend or two. Daniel will again be participating in the season opening concert of the Indianapolis Society of the Classical Guitar on September 13th, 2018, 7:30, at the IUPUI campus. Come and hear the best classical guitar around and support this great organization. Daniel and Heaven Fan will give a performance of harp and guitar duos at Saint Mary’s college in Notre Dame Indiana on October 22nd, 2018, at Stapleton Lounge. This is a noon concert and is free for students and the public. Daniel will be performing with other faculty at Saint Mary’s College in Notre Dame Indiana at noon on April 23th, 2018, in Stapleton Lounge. This is a free performance. Daniel will be performing with harpist Heaven Fan on October 25th, 2018, 7:30pm at Anderson University, York performance hall. They Will be performing works by Maximo Diego Pujol, Alan Hovhaness, Gary Schocker, and Xavier Monsalvatge. Daniel will be performing at the Fort Wayne Cherry Blossom Festival with vocalist Elaina Robbins. This will feature new song arrangements by Shin-ichi Fukuda of popular songs by Toru Takemitsu. The Festival is May 20th, 2018. Daniel will be performing with Saxophonist Farrell Vernon March 10th, 2018, 3:00 pm at the Cincinnati College-Conservatory of Music, Watson Hall. This performance will feature new works by Dr. Vernon. 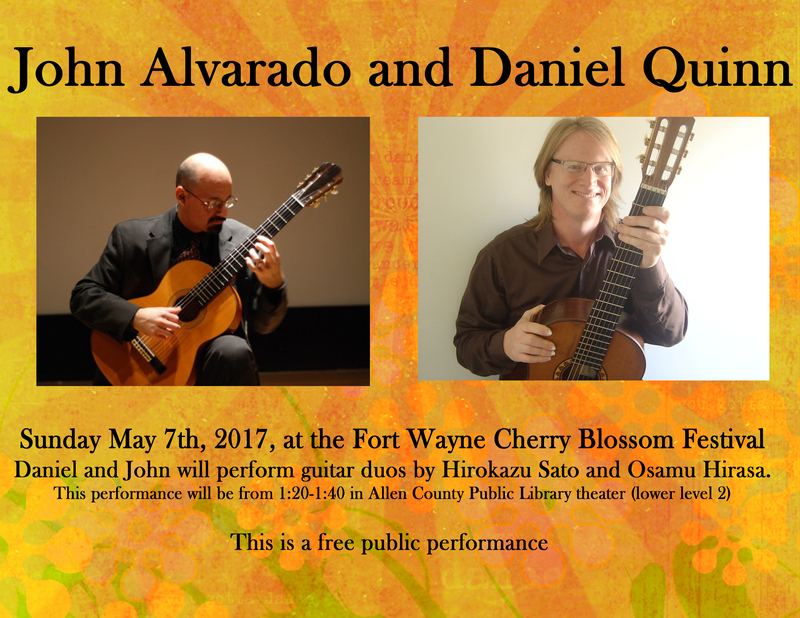 Dan will be performing with John Alvarado at the Indianapolis Society of the Classical Guitar season opening concert. This concert is September 14th, 2017, at 7:30 pm, in the IUPUI school of Informatics in Indianapolis. Tickets are $15. This concert is a fundraiser for the society. Please come out and support this great organization. 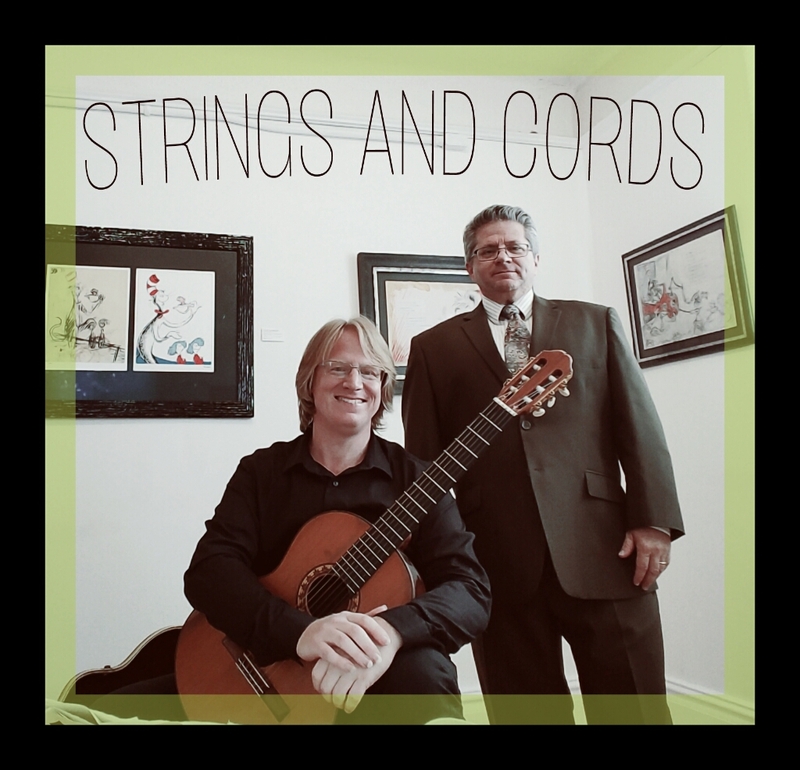 Strings and Cords will be performing for the Wednesday on Wayne Street concert series at First Wayne Street United Methodist Church in Fort Wayne, IN, Wednesday, June 28th, 2017 at noon. Please join us for this free concert followed by a lunch. John Alvarado will Join Daniel on May 7th, 2017, for the Fort Wayne Cherry Blossom Festival. 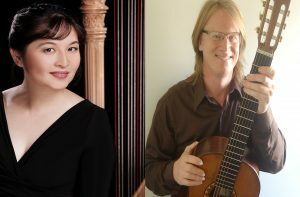 They will perform classical guitar duos by Japanese composers. This is a free concert at the Allen County Public Library in Fort Wayne, Indiana. Performance time is from 1:20-1:40 pm. Strings and Cords will be performing for the Waukegan Chamber Music Society on September 24th, 2017, 7:00 pm at 114 South Genesee street, Waukegan, IL. Strings and Cords will be performing at St. Mary’s College in South Bend Indiana on February 20th 2017 at noon, in the Little Theater in Moreau hall. Strings and Cords will perform at the Kokomo Christ Lutheran Church at noon, October 5th, 2016. 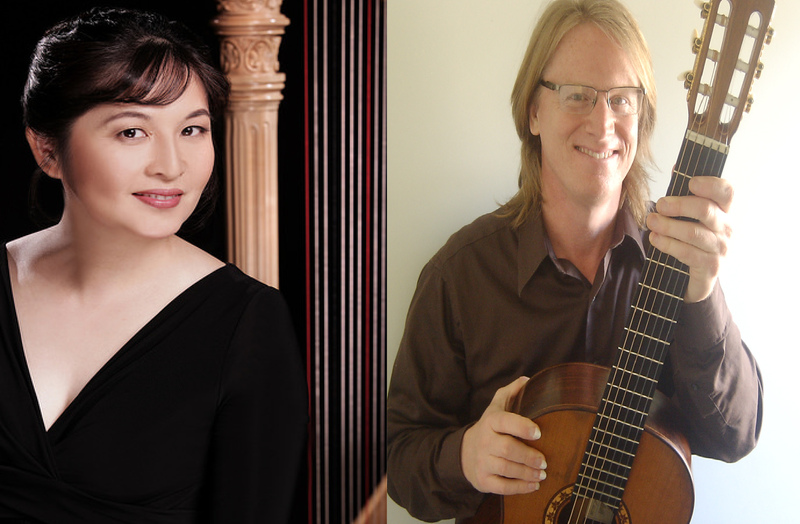 The Quinn-Stachofsky (strings and cords) duo will perform at the opening concert of the Indianapolis classical guitar society on September 15, 2016.